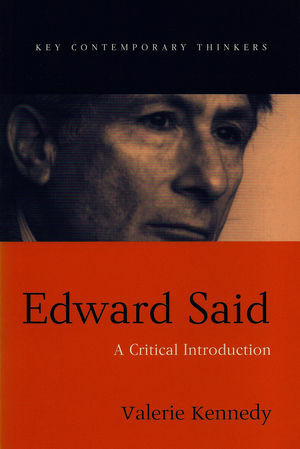 Edward Said is one of the foremost thinkers writing today. His work as a literary and cultural critic, a political commentator, and the champion of the cause of Palestinian rights has given him a unique position in western intellectual life. This new book is a major exploration and assessment of his writings in all these main areas. Focusing on Said's insistence on the connection between literature, politics and culture, Kennedy offers an overview and assessment of the main strands of Said's work, drawing out the links and contradictions between each area. The book begins with an examination of Orientalism, one of the founding texts of post-colonial studies. Kennedy looks at the book in detail, probing both its strengths and weaknesses, and linking it to its sequel, Culture and Imperialism. She then examines Said's work on the Palestinian people, with his emphasis on the need for a Palestinian narrative to counter pro-Israeli accounts of the Middle East, and his searing criticisms of US, Israeli, and even Arab governments. The book closes with an examination of Said's importance in the field of post-colonial studies, notably colonial discourse analysis and post-colonial theory, and his significance as a public intellectual. This book will be of great interest to anyone studying post-colonialism, literary theory, politics, and the Middle East, as well as anyone interested in Said's writings. 2. Imperialism in the Middle East: Palestine, Israel and the USA. 3. After Orientalism: Culture and Imperialism. 4. Said and Postcolonial Studies. "A valuable introduction to the vision and ability of an individual and influential thinker."